Shirley-Anne started writing as a teenager, penning song lyrics and poetry. And when she became a teacher, working in Integrated Schools, she turned her hand to children’s stories and picture books. But her debut is YA fiction. 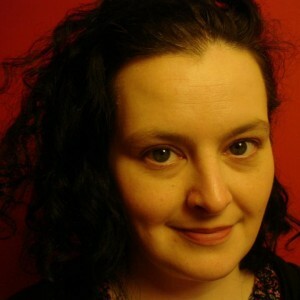 Shirley-Anne also writes and performs with Ikon; a Belfast based Arts group. Education: Fort Hill Girl’s School in Lisburn. Queens University, Belfast; English. Manchester Metropolitan University: Creative Writing. Family: Husband Ian, Ana 11 and Eoin 2. The Day Job: School worker and writer. Favourite Writers: Melvin Burgess; Douglas Coupland; David Almond; Rainbow Rowell; Paul Magrs. The Debut: A Good Hiding. Atom: €8.99. Kindle: €5.33. Life is tough for Nollaig. Her mother died and her father has sunk into alcoholism. She’s tough; standing up to school bullies and to her father, but then she becomes pregnant. She’s 15, and fears a forced separation from her baby, so she goes into hiding. She chooses the crypt of a church, and soon the vicar discovers her. But he has a secret of his own. Nollaig’s best friend, Stephen, helps her out; he knows, only too well, how it feels to be ‘different.’ Will the trio come through their problems and find a resolution? Set in Belfast, this is a gritty, realistic tale. The Verdict: Gritty yet heart-warming. Shirley-Anne is an exciting new voice in YA fiction. Published in the Irish Examiner on August 6th, 2016.